Current theoretical explorations of social communication systems rely on dyadic network-based representations of knowledge sharing. Real-world systems, however, frequently involve larger groups inter-communicating simultaneously. While some of these larger group interactions can be well approximated dyadically, others are left without a natural mathematical description for study. 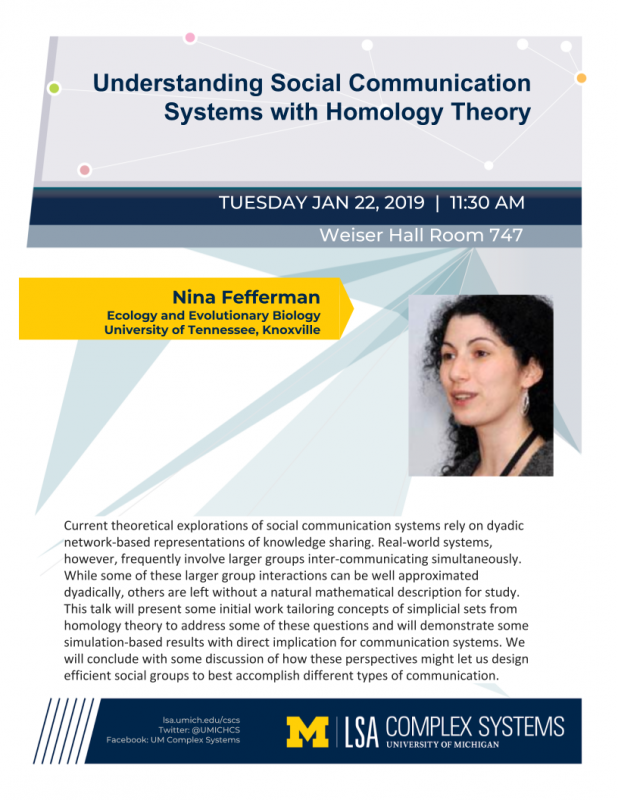 This talk will present some initial work tailoring concepts of simplicial sets from homology theory to address some of these questions and will demonstrate some simulation-based results with direct implication for communication systems. We will conclude with some discussion of how these perspectives might let us design efficient social groups to best accomplish different types of communication.